In recent years growing interest in the problems of the 1930s has brought to light aspects of the labor movement that had been relegated to oblivion by traditional historiography. This is especially true for the council communists who in an America upset by the Great Depression sought to renew a political project that had been crushed in Europe. While there have already been numerous studies of the International Workers of the World1 (IWW) in the harsh and violent context of American factories prior to WW II, there has not yet been any thorough investigation of the convergence of the remnants of the IWW and the council communists. Generally speaking the progressive loss of influence of those defined as "the most dangerous subversives ever raised on sacred American soil" over the American proletariat after WW I, goes back to the incongruence of their strategic "lack of organisation" with the changes imposed on American capital and labor by the real winners of the war: the key auto, steel and rubber industries. Paradoxically, it was their genuine "Americanism" which brought the Wobblies to reject any kind of "political" proposal (even De Leon's) as extraneous to the needs of the enormous majority of their members, largely unskilled and lacking any organizational tradition. This Americanism was formed out of the confrontation with the new reality of the October Revolution along with the emergence of a "new working class" in base industries. It tended to lapse into more traditionally "political" forms of organization and to abandon factories to the CIO's purely industrial syndicalism, which the IWW had once threatened to disrupt. Revolutionary praxis proclaimed in theory by "European intellectuals," overcoming the separation between economic and political struggles. did not seem likely to become a mass reality-not even in a country where industrial concentration provided more favorable conditions for a workers' revolution. The fact that Roosevelt's New Deal was so successful in "politicizing" a labor movement traditionally uninclined to extend the struggle beyond factory boundaries can be attributed to the inadequate "materialist" politiciziation during the pre-WW I strikes led by the Wobblies. Beginning with the Palmer raids, immediately after the war, the Wobblies gradually faded from center-stage in the most significant labor struggles of the period: the great strikes against the steel industry to dismantle that open shop and industrial feudalism which the IWW had been the first to radically oppose. Preoccupied with the legal defense of nearly all its leaders and torn by internal struggles between the supporters of centralization and the "decentralizers" over the ideological repercussions of the October Revolution the IWW could not adequately respond to the strikes. By stubbornly reiterating its historical rejection of any legalization of the struggle between capital and labor, the IWW only succeeded in retarding the institutionalization of collective bargaining in the steel industry first sought by one of its ex-members. William Z. Foster. Yet, the "first general strike in American history" -i.e., the 1919 Seattle strike, which was characterized by a militant solidarity among, organized, non-organized skilled and unskilled workers from local metallurgical industries -still reflected the Wobblies' active prresence, especially in its methods of struggle and propaganda. But from then on, instead of becoming the mass labor organization that had been predicted by the supporters of industrial unionism, the IWW began to lose its historical role as a radical proletarian organization. The same mass spontaneity that had greatly contributed to the IWW's success in advocating the Free Speech Movement (which demanded the extension to the factories of constitutional liberties) began to grow and assert itself in civil society. The IWW, however, was not able to respond to the new demands prefigured by the steel strikes and the break-up of the old American Socialist Party as a result of Comintern attacks. The clash within the labor movement between the "jealous guardians" of a genuine but small native tradition of labor struggles and those who were quickly branded the "dogmatic followers of Moscow's directives" took place as a result of the attempt to apply Lenin's doctrine to U.S. conditions. In addition to criticizing the German and Dutch left-communists in Left- Wing Communism, Lenin had alt attacked the Wobblies. From the moment that it became a potential alternative to the AFL, the IWW had emphasized the need for dual unionism. Lenin's approach that sought to quell any attempt to found new revolutionary Organizations and, instead, to penetrate official labor organizations, was doomed to fail. The American labor movement's "Great Depression" of the 1920s shows the effects of grafting new communist "revolutionary energies" onto the old AFL body. Eventually even the "followers of Moscow's directives" became aware of the AFL's decreasing representativeness and decided to create autonomous Organizations along industrial unionist lines (the Trade Union Labor Leagues). By that time, however, it was too late as the break between the communists and the IWW had already taken place. The struggle against attempts to impose the Soviet model in the U.S took place within a context significantly different from that obtaining in Europe. In the latter-particularly in Germany, burdened as it was by the Treaty of Versailles-the severe consequences of the war prevented a quick capitalist response to the revolutionary crisis. In America, on the other hand, capitalism successfully launched a potent counteroffensive from the strongholds of industrial, feudalism (the basic industries that the AEL had found impenetrable) against the "jewels" of industrial syndicalism-i,e., the United Mine Workers and the Amalgamated Clothing Workers of America. The decline of the only American labor unions having the right to collective bargaining and their difficult struggles to prevent the re-introduction of the open shop and company unions during the decade prior to the Depression did nor trigger any new organizational departures. The failure of the great against U,S. Steel was not simply due to the owners' strength, but also to the blind corporativism of the Amalgamated Association of Iron, Steel and Tin Workers, and that of other reformist labor organizations. The sterility of the 1920s also had a lot to do with the "Little Depression' of 1921-22, the massive re-entry of "Pinkerton's Army" into the factories, and the growth of yellow syndicalism During that time even confrontations with similar positions rejecting the Bolshevik organizational model and the Third International's plan to re-enter the fold of labor unions and reformist parties failed to reopen any organizational discussions within the IWW. Contacts with German and Dutch left-communists who also shared an anti-Bolshevik outlook were established through the bureaus of Amsterdam and Berlin, but came to naught. The rejection of the party, which had been most adamant among the IWW workers in the Pacific Northwest, reflected the influence of an historically outdated type of worker, who was rapidly being displaced by a new type. The IWW's 1924 Chicago congress (held exactly one year after the unsuccessful Centralia, Oregon, strike) only confirmed its paralysis. The "decentralizers" of the Emergency Program succeeded in expelling from the General Executive Board those who supported strengthening the central executive body and who were inclined to enter into a dialogue with the Third International's emissaries. But after this, they found themselves with nothing to do but manage from the Chicago office and from the columns of the Industrial Worker what remained of the "indomitable spirit of the workers' rebellion" that had been for so long synonyrnous with the Wobblies. Although the 1927 coal strikes in Colorado and in "bloody Harlan" (undertaken by the Eastern and Midwestern sections faithful to Chicago) indicated that the IWW was not entirely dead, still, long before the 1947 Taft-Hartley Act put them out of business for good, the Wobb lies had ceased to be a major force in American labor despite the visible activism of many former members of the General Executive Board who continued to fight for the labor cause. Thus, the European militants who emigrated to the U.S. because of the failed "March action" in Germany or because of Hitler's rise to power, found the guardians of a tradition themselves in need of protection rather than the exponents of a thriving organization. In order to understand the reasons why middle-European left-communists chose to emigrate to the U.S., it is necessary to summarize their political and theoretical tradition. Confidently proclaiming the "fatal crisis of capitalism" and the ensuing "worldwide workers' revolution," they saw the U.S. as the strongest capitalist country with the most radical labor tradition (the IWW) -hence, as providing the ideal conditions for the rapid development of that class autonomy which in Europe had been handicapped by capitalism's structural backwardness and by the labor movement's tradition of reformism. In the debates within the majority faction of the German Communist Party (KPD)-transformed into the German Communist Labor/workers Party (KAPD) after breaking with Paul Levi at the 1919 Heidelberg Congress-all sides accepted one central thesis: the theory of the inevitable collapse of capitalism (Zusammenbruchstheorie) - The KAPD's theoretical position, in fact, defined the party as the working class's revolutionary instrument in a situation characterized by the death throes of capitalism a This state of affairs is brought about by what Luxemburg called the "saturation of the market" and is accelerated at the factory level through the AAU (Autonomous Organization of Workers) by an economic struggle which the system can no longer control through reformist labor organizations. It was this fatalism that set the left-communists against the Third International and that forced Lenin, in his Left- Wing Communism, to bring his full weight against what was gradually appearing as a dangerous heresy within the communist movement. Unfortunately, this struggle culminated in the Bolshevization of the German Communist Party and the subsequent departure of all Luxemburg's followers. Differences among the left-communists themselves-leading to the AAU-E breaking away from the AAU and the March 1922 split in the KAPD - also had their roots in the theory of the crash. Inspired by Ruhle's radical anti-party positions, the AAU- E was predicated on the ultra-leftists' fundamental thesis: the immediately political character of economic struggles in a phase when capitalist survival is only possible with the absolute impoverishment of the working masses. The March 1922 split, which resulted in two KAPDs, each with its own press and organizational center (the Essen and the Berlin KAPD), was based on two different interpretations of the concept of "fatal crisis." Discussion of the theory of the crash also came to involve the co6ncil communists, who were the heirs of the left-communists' thought . The report of the KAPD central committee, which anticipated the creation of a new Communist International pending imminent worldwide revolution, did not express the position of the whole party but, rather, represented the perspective of the "intransigent" wing, led by the central committee itself and by the leaders of the Berlin group. Opposing this was the faction headed by the Geschaftsfuhrender Hautptausschubb, which favored limiting the party's tasks to internal consolidation in order to confront regrouping capitalist forces (which were far from collapsing). (This faction included one of the future founders of council communism, Anton Pannekoek, who-already opposed to the Luxemburgian theory of the crash-was then developing a new critique of more recent versions of that theory.) Pannekoek's rejection of the theory of the crash expressed his own voluntaristic approach to the theory of revolution, based on the Dietzgenian "spirit" of the proletariat. This was the foundation of his critique of Kautsky's "fatalism" and Luxemburg's "economic determinism." 'Luxemburg's own critique of the German Social-Democratic Party and of the Second International was based on the connection she saw between the logic of the mode of production and that of the revolutionary project. But the opposition of Pannekoek, Hermann Gorter and Henrietta Roland-Holst to Kautsky's "mechanistic" conception of the revolutionary process and its organization began with the subjective factor of "creativity" and "autonomy. " This dogmatic and basically ahistorical faith in the revolutionary potential of the masses led to differences of opinion regarding the feasibility of immediately abandoning reformist organizations. It also resulted in the creation of an organization independent from the Spartacist League, the Internationale Sozialisten Deutschlands of Bremen, which in 1918 changed its name to the Internationale Kommunisten Deutchlands. The reunification of the two wings of the left-radicals- Luxemburg's faction and that of the Dutch-occurred at the KPD Congress. The basis for this is to be found in the anti-syndicalist and anti-parliamentarian theses of both wings as well as in the council-inspired principles of the "German International Communists" (already criticized by Luxemburg). But this reunification did not entail that each faction give up its separate existence and, until the 1922 split both remained within the KAPD. The break between the Essen and the Berlin branches took place in a situation of revolutionary instability and sanctioned the crystallization of a theoretical conflict which, within the frame of the council program of the left-communists,also involved practical differences. Gorter who stressed the need to reunify the KAPD supported the Essen branch by participating in the foundation of the Kommunistische Arbeiter-Internationale (KAI) and' by initiating his famous debate with Lenin. Pannekoek on the other hand, increasingly emphasized the theses already developed in Weltrevolution und kommunistische Taktik that explained the slow revolutionary process in Western countries by reference to the spiritual hegemony of the bourgeoisie which, despite the collapse of its economic basis, was still able to survive. Pannekoek's rejection of the theory of the crash after it had been reasserted by the Berlin faction led him to participate in the discussion that took place within the KAPN (Dutch). established in 1926 as the "Group of International Communists" (Groep van International Communisten, GIC). His attempt at an anti-deterministic reconstruction of the economic theory of council communism gave rise to the Dutch Marxist School's final significant theoretical effort; the Grundprinzipien Kommunistischer Produktuion und Verteiliung (fundamental principles of communist production and distribution). Plagued by constant casual dispersals and regroupings from the unsuccessful epilogue of the 1923 crisis (the debacle of the "theory of the offensive") to the Nazis' accession to power. the theme unifying the middle-European radical left can be traced in the debates concerning the historical necessity of socialism. Luxemburg's account of this was by no means fatalistic inasmuch as it sought rather than excluded, the working masses' "autonomous activity" (selbsttatigkeit). Often combining Luxemburg's account with the Dutch focus on subjectivism the left-communists developed a critique of reformism as a guarantee of the exchange equivalence between capital and the commodity labor-power within the general laws of capitalist accumulation. The basis for this hybrid account can be found in the connection between the capitalist crisis and revolution which in turn provides the objective foundation for the workers' struggle for emancipation - something that Luxemburg had already pointed out against Kautsky's "optimistic evolutionism." According to this interpretation reformism was a mere product of the ascending phase of capitalist mode of production and, therefore destined to perish with it during its last, "fatal" crisis. But this was also the source of their eventual criticism of Lenin's theory of organization which they saw as deriving from a voluntaristic and subjectivist vision, relegating creativity only to the leadership. To reiterate: the Luxemburgian formulation provided the basis for the council theory of organization. As in Luxemburg organization was seen as an expression of "workers' spontaneity," constituting the actual overcoming of that split between "economic" and "political" struggles which had characterized the labor movement during the laissez-faire, ascendant phase of capitalism. This political and theoretical debate explains the attempt by a small group of council communists (almost all of whom were German emigrants) to test within the compact monopolistic order of American capitalism a strategic hypothesis that seemed to be too far ahead of the times in Europe. Thus, the theoretical debate that had tormented first the left-communists and then the council communists moved to the U.S. or, more precisely to the remaining active centers of the IWW. Because of the lack of any emancipatory development in existing movements, American labor's 1920 stagnation favored the transplantation of foreign political experiences onto American soil. Later, the Great Depression offered an exceptional opportunity for the consolidation and development of middle-European revolutionary hypotheses. In fact, the latter seemed to provide the only usable tools for understanding the radical mass organizations that were spontaneously formed by the unemployed in the new realities of Hooverville since the vanguard organizations of the whole American labor movement were caught completely unprepared by developments whose causes and results remained incomprehensible. 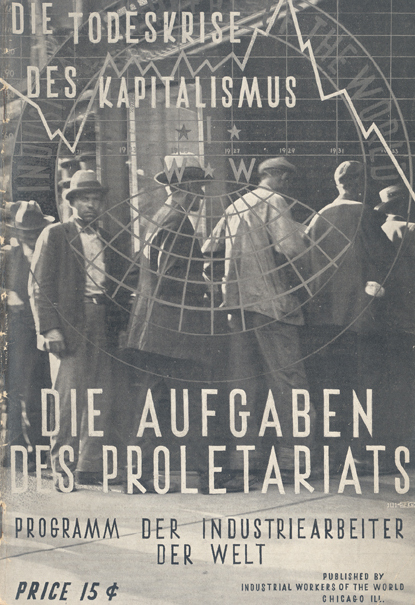 This also explains the impact of German militants connected with the IWW working in the new Chicagoer Arbeiter Zeitung, edited by Mattick, and the Communists' early success in the "unemployed councils." It was within these organizations that the advocates of the "theory of the crisis" were most successful. It was in their educational meetings that their analyses were rigorously developed, as Korsch favorably notes in a letter to Mattick. There, they undertook a critical re-elaboration of the Luxemburgian thesis, which would later constitute the theoretical platform of the Groups of Council Communists and, after 1934, of their journal International Council Correspondence. In the meantime, New Deal legislation was being passed. Modeled after the early 1932 Norris-La Guardia Act which had dealt a heavy blow to industrial feudalism, Section 7(a) of NIRA extended the right of collective bargaining-until then the privilege of only a few labor unions-and fixed both the maximum number of working hours and the minimum wage. This law had a far greater impact than did all the public works programs scheduled by the 1932 Emergency Relief and Construction Act. It opened new possibilities far beyond the closed circle of alternatives envisaged by business-sponsored anti-crisis projects based on the theory of self-regulation and by those of AFL unionists that emphasized the 30-hour work-week demand (Black bill). Actually, only the labor struggles that began in the rubber factories of Firestone and Goodyear (the sit-down strikes of 1936-37) and culminated in General Motor's capitulation to the United Automobile Works's, succeeded in legitimizing collective bargaining. Even though it was constantly boycotted by the appeals of Big Business and NAM to the Supreme Court, this law was eventually reasserted by the Wagner Act of 1935.W Still, Roosevelt's initiative gave a "constructive" imprint to tendencies that were 'already objectively present in the new working class created by Fordism. As such, it constituted an actual capitalist anticipation of the class adversary, which had appeared on the verge of developing a revolutionary solution to the crisis. But corresponding to this apparently "anomalous" behavior of the State, there was a similar anomaly in the union movement. Instead of the decadence and repression that marked its European counterpart the American labor movement seemed to enjoy one of its brightest moments in the constitution of the do (i.e., with the triumph of the long-sought "industrial unionism"). The impressive and radical nature of the sit-down strikes that quickly overran citadels of industrial feudalism such as GM, Chrysler, and U.S. Steel, marked the overwhelming victory of the CIO, whose membership grew, in only one year, from 800,000 to over three million. What this ultimately meant, however, was the complete acceptance of the capitalist laws of exchange by men who, like John Lewis, had directed the great 1937 labor offensive. In order to locate the subjective limits of the "objective" radicalism of the 1930 labor offensive, it is important to recall that Lewis was not only one of the major CIO promoters (whose penetration into heavy industry had been financed from the miners' union treasury), but he was also the only labor leader who broke the social pact upon which the New Deal was based by unleashing "his" miners against the American war machine in the middle of WWII It was this turn of events that led the council communists (through Mattick) to reassert their complete distrust in the emancipatory abilities of unionism, even in its new "industrial" mass guise. The council communists regarded the American situation as different than the European one precisely because of the persistent vigor of U.S. private capitalism. Although it was not able to initiate an economic recovery along traditional lines, private capital could still obstruct the transfer of the accumulation process to state capitalist foundations, as shown, for example, in the resistance of Ford, Little Steel, and Swift & Co., to unionization. Roosevelt saw the task of labor organizations to lie precisely in overcoming this opposition. Thus, the council communists' task was the reconstitution of the theoretical framework for analyzing the capitalist crisis in view of the structural modifications created by massive state intervention. This entailed a careful re-examination of the "classical" (underconsumptionist) Luxemburgian theory of the collapse. The syndical, and, within the framework of the New Deal, statist outcome of American labor struggles was evident in their inability to transpose their attacks against the despotic power of "old" private capital in the factories to civil society, now subsumed directly under the accumulation process. This, taken together with the passive resistance of the European masses (with the exception of Spain) to fascism and Nazism, led the council communists to seek within the logic of capital and the new epoch-making developments it had brought about, an understanding of the new realities rising from the ruins of 1929. Within capital meant within the crisis. Only one attempt had been able to go beyond the Luxemburgian approach to the problem of capitalist accumulation as the "materialist" condition for socialism: namely, Henryk Grossmann's book on the law of accumulation and the collapse of the capitalist system . By taking up the polemic between Rosa Luxemburg and Otto Bauer concerning the Marxist production schemes, Grossmann had attempted to faithfully reconstruct the Marxian law of accumulation in order to clarify the necessity of collapse inherent in the very mechanisms of capitalist production. By rejecting all "exogenous" explanations of the crisis-from those which, following Tugan-Baranowski's Studien zur Theorie und Geschichte der Handelshrisen in England saw in the anarchy of the capitalist market the origin of crises of "disproportionality" to those based on the hypotheses of insufficient consumption - Grossmann developed a rigorous critique of Luxemburg's Accumulation of Capital. Beginning with Bauer's scheme concerning the infinite endogenous possibilities for capitalist development and the exogenous character of the limits on this development - i.e., "working class rebellion" - Grossmann sought to show how the crisis and the collapse both sprang necessarily from a system "theoretically" void of the difficulties of "realization" that beset Luxemburg's theory of accumulation and imperialism. According to Grossmann, Luxemburg came to her famous "correction" of the Marxist reproduction schemes as a result of a misunderstanding of Marx's own approach. Having failed to keep in mind both the basic distinction between the mode of research and the mode of exposition explicitly established by Marx in the postscript to the second edition of Capital, and the complex relation between essence and phenomenon (and at another level, theory and praxis) implied in the critique of political economy, Luxemburg had committed a fundamental error: chat of attributing to bjective social existence" to the reproduction schemes. The relations with which Marx had "simply wished to express" (Mactick) the proportion (also manifest at the level of the "two spheres of production and their relations of exchange") between surplus-labor and labor (surplus-value and value) had been seen by Luxemburg as the numerical "representation" of the capitalist reproductive process. Hence, Luxemburg had not understood the theoretical and cognitive implications of the level on which Marx was operating (the level of total capital [Gesamtkapital]), even though she had already stressed that it did not coincide with the "multiplicity of concrete capitals." Total capital, as that level where commodities are exchanged on the basis of their value and not - as Luxemburg assumed - also on the basis of market prices, presupposed in Marx's account that the realization of surplus-value had already been achieved. In this reproduction scheme, Marx had hoped to express commodity exchange as a necessary presupposition of the capitalist mode of production. In answering Sternberg's "Luxemburgian" criticism of his work, Grossmann elaborated a whole series of problems at the thorny level of the "transformation of values into prices," thus clarifying both his critique of Accumulation of Capital and his own theory of the crash. Beginning with the "Hegelian" notion of science in Marx as knowledge of the "hidden essence" and of the "internal connections" among empirical phenomena, he constructed an abstract scheme (rigorously tied to the theory of value) of the accumulation process. This necessarily led to the system's collapse because of the falling rate of profits resulting from the rise in the organic composition of capital. This necessary tendency toward capitalism's fatal crisis was not related to any external contingency (as in the exogenous theories of the crisis~. Rather, it was rooted in the dichotomous structure of the system's own "cellular form" - the commodity - which entailed the division of abstract labor (that producing exchange-value) from concrete labor (that producing use-value). Grossmann placed this division at the base of the "two-dimensional" character of the critique of political economy. This entailed a "necessary internal connection" of the theory of accumulation, the theory of value and the theory of the crash. Grossmann had sought to trace the "general possibility" of the crisis in the capitalist productive (and reproductive) process alone, free from any external friction. "The most' abstract form of crisis (and therefore the formal possibility of crisis)," Marx had written, "is thus the metamorphosis of the commodity itself; the contradiction of exchange-value and use-value and furthermore of money and commodity comprised within the unity of the commodity, exists in metamorphosis only as an involved movement." While the relations established at the level of total capital represent an abstraction which is, of course, indispensable for understanding and explaining empirical events, it excludes the labor process. As Marx pointed out: the "direct relation of the different component parts of capital to living labor is not connected with the phenomena of the circulation process. It does not arise from the latter, but from the immediate process of production and its [expression] is the relation of constant to varable capital whose difference is based only on their relationship to living labor." Hence, the analysis at the level of total capital can define only the abstract and general possibility of the crisis, without considering its causes. "The general possibility of crisis is the formal metamorphosis of capital itself, the separation, in time and space, of purchase and sale. But this is never the cause of the crisis. For it is nothing but the most general form of crisis, i.e., the crisis itself in its most generalized expression.". According to Marx, then, the form of the crisis cannot explain how the potential crisis can ever be realized. Being the result of "changes in prices and revolutions in prices" the crises do not coincide with the "changes in the values of commodities;" hence, they could not be explained naturally from "the examination of capital in general, in which the prices of commodities are assumed to be identical to the values of commodities. " Only the "general conditions of the crisis," apart from price and market fluctuations, had to be explained on the basis of the "general condition of capitalist production." But the shift from the form of the crisis to its reality implied a parallel shift from the value to the prices of commodities. Thus, if Luxemburg rightly thought it foolish to expect the collapse of capitalism because of the falling rate of profit, she had not understood the "self-suppression" of capitalist production expressed by this tendential fall (meaning the "value scheme" of capitalist expansion). The latter is the "theoretical precondition" of concrete capitalist reality "based on value but regulated by production prices." According to Grossmann, the primacy of the law of value over the dynamic of commodity prices must be related to the level where the average rate of profit is formed: the "center of gravity" of the entire capitalist world. Despite the empirically ascertainable "tendency of the rate of profit to level off in the various productive sectors (confirmed from Ricardo and Malthus up to Bohm-Bawerk), Luxemburg denied the "possibility of transferring a part of surplus-value from section II to section 1," and she based her entire theory of capitalist accumulation on this point. At the same time, she held fast to the principle of market-exchange of commodities according to their value and not their production costs. Thus, she could no longer explain "the formation of the average rate of profit within the theory of value," Stubbornly adhering to the theory of value, Luxemburg had in effect abandoned the theoretical foundation of the Marxist system by completely ignoring what she herself had defined as "one of the most important discoveries of Marxist economic theory." Grossmann's corrections and elaborations of Luxemburg's work allowed Mattick, one of the leading exponents of the American council communists, to construct the theoretical base underlying his analysis of the New Deal and fascism in International Council Correspondence. By discarding the most clearly dated aspect of Grossmann's theory (i.e., his over-evaluation of the importance of the Marxist reproduction schemes), Mattick was able to rescue its "rational kernel," which he located in the relation between the theoretical model of the crisis, rigorously based on the law of value, and empirical reality "modified" by market mechanisms. In polemics with Korsch's and Pannekoek's "subjectivist" criticism of Grossmann's apparent fatalism, Mattick typically introduced the first issues of International Council Correspondence with an essay dedicated to Grossmann's work, which in the meantime had be come one of the key texts in the council communists' "Schcools." By penetrating the complex Marxist framework and rediscovering in the crisis the essence of the capitalist system Grossmann had succeeded in focusing on the real "practical and theoretical nexus of Marx's double criticism of capitalism. If, indeed, the critical and revolutionary substance of Marx's dialectical method was its understanding of the existing state of affairs as well as its inevitable crash and therefore its transient nature - Grossmanns merit was to have deduced from an understanding on the level of philosophy of history, of the historically determined and declining character of capitalist production," the"social tendency which realizes this historical tendency, the contradiction between the forces and relations of production." But if the theory of the crisis 'reconstructed" by Grossmann allowed him to discern its historically determined social bases (the relations of production founded on the separation of the producers from the means of production) by cracking the apparent "naturalness" of the valorization process (i.e., the means whereby value is produced), it was subsequently forced, by the same law which it had used to identify the socio-historical essence (the law of value), to take on once again the fetishistic mantle of economic necessity. The "quantitative" relations Grossmann had used to express the "inexorable" growth of constant in relation to variable capital (by relying on Bauer's absolutely arbitrary figures), referred back to the social relations between value and surplus value (between labor and surplus labor) which constitute the very condition of the capitalist accumulation process. Increases in the productivity of labor, the motor of the accumulation process presupposed the double character of the commodity labor-power, that of having not only an exchange-value but also a use-value. The limits of accumulation manifested in the market in the form of the problem of the organic composition of capital and, finally, as an economic tendency toward a fall in the rate of profit-were related once again to its dependence on surplus-value, in turn limited by the fact that it could only be an effect of surplus-value, i.e., only a part of total labor. In this sense, Mattick could provide an interpretation different from that of "underconsumption theoreticians," of the famous passage where Marx writes that: "The ultimate reason for all real crises always remains the poverty and restricted consumption of the masses as opposed to the drive of capitalist production to develop the productive forces, an, though only the absolute consuming power of society constituted their limit,"The limit to mass consumption could not be cured by any Keynesian political strategy of "social consumption, "inasmuch as it was itself bound to the structure of production (i.e., the extraction of surplus-value) and the profit system. Thus, the opposed grouping underconsumption-surplus-production only expresses the "phenomenology" of the crisis, the essence of which is to be traced in the social relations of production between labor and surplus-labor (value and surplus-value), manifested on the purely economic level as an increase in the organic composition of capital and consequently as the tendency toward a fall in the rate of profit. Grossmann's merit, then, consisted in having emphasized the revolutionary character of the Marxist method of exposition: it did not merely "reflect"empirical reality, but provided a hermeneutic interpretation; it was not mere speculation on real connections, but an active theoretical intervention over them. On the basis of this highly significant epistemological rediscovery he had built a theoretical model of the crisis able to explain the ambiguities and equivocations which had given rise to positions foreign to Marxism of the "harmonic," "neo-harrnonic," and the "collapse" hypotheses related 'only to the empirical phenomena of circulation. The accumulation process described by Grossmann was, as Mattick would say later, "the logical result of an implicit line of development referring only to production and capital accumulation in a System where total labor is opposed to total capital. Therefore, it is the logical result of having exposed the means of producing surplus-value and the dynamic behind the accumulation process In other words, it is the recognition of a "dominant tendency within capitalist development that forms the basis of the real movement of capital and constitutes the key to Its understanding. It Serves to demonstrate that all the problems of capital ultimately arise from capital itself, from the production of surplus-value and from the development of the social productivity of labor determined by the capitalist mode of production itself ~ The theory of value bound to labor time, which is abstract vis-Ã -vis the market but at the same time concrete vis-Ã -vis relations of production, was to be considered an "intellectual construction," in the special sense of a uniquely theoretical grasp of the alue relations" hidden "behind prices Only an analysis of value, as Mattick recently said, "allows one to move from the abstract to the concrete since it can show the connection between relations in the market and the given relations of production by finally clarifying the total process of the capitalist economy. ' As Mattick made quite clear in The Inevitability of Communism we are not faced with "a purely methodological procedure involving a' progressive approximation to the difficult to penetrate world of commodities but with "an objective foundation of this world," the keystone of the entire system of the "various forms of capital." If the laws outlined in the Marxist model of the logical unity of total capital only point to the historical limits of the capitalist mode of production without indicating in the least the "moment of its dissolution"-as Mattick stressed in reference to Grossmann - they could thus be understood by reference to changes in the market form itself brought about by competition and, above all, by reference to the measures adopted to prevent its final collapse (what Marx listed as countertendencies). Even the capitalist state's new function of direct intervention in the economy was interpreted as a countertendency aimed at blocking the possible collapse entailed by the general crisis that occurred with the attainment of a level of organic composition all out of proportion with the surplus-value usable for purposes of accumulation. The tendency toward a monopoly state capitalism in the U - S. took on a form that appeared quite different from the form that it took in Europe. The New Deal represented the attempt to integrate labor into a project of supporting demand, in view of Keynes' "low propensity to invest." Although tactfully financed by the State, it was nonetheless strategically advantageous to reluctant private capitalists still imbued with the ideological nostalgia of laissez-faire. In Nazism and fascism. however, limits were placed on consumption. labor unions were suppressed and authoritarian economic planning forced the relaunching of the accumulation process. But in both cases state intervention in the economy suspended the market's competitive laws by continuing and "nationalizing" a practice already begun by monopolies thus marking an organic weakness in the capitalist mode of production. As stagnation in the accumulation process, the crisis could no longer be overcome with classical measures because of the high level of the organic composition of social capital. The "normal" destruction of capital was demonstrated inadequate to lower constant capital and re-establish its ratio with surplus-value. Where the destruction of the use-value of the labor force (fascism) was no longer sufficient or feasible, it had been necessary to destroy capital through the unproductive expense of public works and armaments. As a countertendency state capitalism was not able to resolve, but only to raise to a different and higher level, the contradiction implicit in the capitalist accumulation mechanism. As Marx put it in the third volume of Capital: "the same influences which produce a tendency in the general rate of profit to faIl also call forth counter-effects, which hamper, retard, and partly paralyse this fall. The latter do not do away with the law, but impair its effect." After the harsh refutation of Korsch's prediction of a working class explosive response to the maturation of capitalism (represented by fascist, Rooseveltian or Stalinist state planning) and in the face of fascist counter-revolution, Korsch undertook a revision of Marxism which eventually resulted in the Zurich Theses. Mattick, on the other hand, rediscovered in the countertendencies of the New Deal and fascism further confirmation of Marxism's anticipation of the capitalist system's collapse. The differences among the counter-measures adopted by various forms of capitalism were determined by a difference in the intensity of their respective accumulation processes. American "corporate capitalism." less strained than its European counterpart turned the organized labor movement into one of the hinges of the "new" Keynesian system (based on the "multiplier" effect of state expenditures), owing to the energy that still remained at the disposal of private interest groups. The public works programs that were adopted after four futile years of trying to overcome the crisis by eliminating value (the concentration and elimination of "minor capital") and mass unemployment, were essentially modified forms of the destruction of surplus-value carried out by diverting it into unproductive channels - "pyramid building" - thus controlling the social tensions resulting from stagnation without at the same time creating additional capital. By analyzing the principles of Keynes' General Theory regarded as the "scientific legitimation" of such measures as public works, unemployment benefits, social security etc., Mattick developed his critique of the Keynesian system of the "mixed economy." As has been recently pointed out, when examined from a rigorously Marxist perspective, Keynes' theory contains a correct intuition along with a "classical" error. He was the only economist among his contemporaries to locate clearly the kernel of the crisis in what he called "the low propensity to invest," which be attributed to the diminished "marginal efficiency" of capital. By emphasizing the close tie between the idle money and idle men of the crisis and the capitalists' "liquidity preference" - a preference which, moreover, he traced as a constant through the entire history of humanity - he expressed the "natural" connection between the crisis and the fall of the rate of profit which had been identified by Marx with the capitalist process of expansion and accumulation. But he only provided a tactical solution to the crisis, anchored on the level of distribution. On the level of capital however, the Keynesian solution was apparently unable to re-establish the very condition for accumulation, the ratio between additional capital and accumulated capital. on whose fate rests the whole process of capitalist growth. The profitability of capitalist investments is rigidly determined by the amount of capital already invested (accumulated), so that compulsory investments imposed by the State do not by themselves guarantee a productive return. The excess capital which is not "productively" employed during the crisis is exchanged for revenue, not being able to be exchanged either for constant or variable capital. In other words, it is realized through an exchange for part of the surplus-value produced and not "capitalized." The realization of this revenue, then, comes about at the expense of the surplus-value already realized in the sectors where there is productive use of capital (an exchange of wage-goods for capital-goods, of constant capital against variable capital). State-financed production, by representing the counter-value of surplus-value not accumulated and appropriated by the state as taxes, is realized by exchanging surplus-value for revenue, Thus, it takes place at the expense of other sectors and at the expense of accumulation in general. Far from resolving the capitalist difficulties of accumulation - curable only through an increase not in total income, but only in that part which can be capitalized for purposes of accumulation-state intervention (apparently antithetical to the law of value) is in the long run destined to intensify the contradictions of the system founded on profit. What has been called the "most serious depression in American history" emerged in 1937, suddenly reasserting the exigencies of accumulation four years after Roosevelt's "hundred days" had dissolved any illusion about the miraculous effects of "pyramid building" or the "social pact" signed by John Lewis and U.S. Steel. The Marxist theory of the crisis as resulting from the tendency of the rate of profit to fall reversed the crisis'" appearance" in the sphere of circulation by tracing the apparent over-accumulation of capital to an actual lack of accumulation. Thus, it exposed as fraudulent every solution proposing the reabsorption of over-production through an artificial increase in demand generated by public debt. At the same time, the war (i.e., production for classically and exclusively destructive purposes) revealed the truth that the New Deal was subject to the law of value like every other capitalist state. Essentially, the New Deal had paved the way for the development of monopolies by introducing labor unions into large factories and exempting the price of labor-power from the "free laws of supply and demand," thereby ruining small businesses and encouraging that process of concentration which Marx had seen as an "external coercive law" imposed by the necessities of accumulation. The 1937 crisis showed the inadequacy of eliminating competition at the national level. Thus, the pursuit of super-profits, on which the growth of monopolies is based, had to shift to the international level to construct a comprehensive system of cartels which constituted the only possible structure proportionate to the capital already accumulated. Given that the amount of additional capital for expansion is determined by the amount of capital already invested, then in order to increase profits, it is necessary to increase the number of workers and to have them work under more profitable conditions. It was at this point that stagnation set it, since inactive capital (regardless of its absolute amount) had turned out to be inadequate in relation to the needs of capitalist expansion. Only a further concentration and centralization could create the basis for overcoming the impasse in the accumulation process. The war revealed the truth of the New Deal also in the sense that it laid bare its authoritarian and strategically anti-labor foundation: the no-strike pledge made to the state by labor union leaders faithful to the regime, the freezing of wages, and the repression of the miners' strike by the National Guard, indicated that the submission of all social productivity to destructive forces had already been accomplished. Monopolization and government control were transforming the American economy into a "guided" economy-i.e., into an economic system where "the mechanical and self-contradictory forces of capitalist accumulation" remained determining factors, while at the same time the monopolistic control of various products and distribution independent of the market was in the process of being institutionalized. This, however, should not be confused with a "consciously directed economy," which is impossible within a system still based on commodity production, i.e., the central form of the crisis itself. Thus, the elimination of competition did not constitute the overcoming of the law of value over the productive, and reproductive mechanisms of capitalism, but rather its reassertion, From a Marxist perspective, competition could only lead to a pricing of commodities according to which all capital yields the same profit in relation, to its magnitude, which, as Marx pointed out, is itself independent from competition. Mattick adds: "But all depends on this magnitude. Capitalism, being production for profit, prospers, stagnates or declines in accordance with the movements of the profit rate. In addition to others, its most important economic difficulty consists in the decreasing profit rate that accompanies the formation of capital. This tendency asserts itself under all the forms that capitalism may assume; it determines to a large extent the changes in form." The crux of the various capitalist solutions to the crisis was their necessary submission (independently of their pretense of "rational" planning) to the laws of accumulation, as external coercion to the maintenance of a given relation between constant and variable capital. In their common outcome in war, both "deflationary" (fascism) and "inflationary" (Keynes) solutions demonstrated the strategic inadequacy of interventions exclusively focused on wages (as variable capital) without adequate destructions (lowering) of constant capital. It was not accidental that Keynes, too, by identifying product, income and profit, seemed to ignore, along with the "classics" of political economy before him, the determining importance of constant capital in the formation of profit. The intrinsically capitalist character of the two "solutions" prevented them from acknowledging the essential disproportionality for capitalist development. This disproportionality could not be corrected by government regulation of the various productive and distributive sectors, since it involved the birth, growth and death of capitalism: the disproportionality of development of the two components of capital-variable (wages) and constant (the means of production). Thus, the war matched two basically similar systems (the"Allies and the Axis). With different tactical tools, both had tried to overcome stagnation by accelerating the concentration process which, in the absence of the "autonomous action of the working class," led necessarily to the most general form of concentration determined by war, If the struggle appeared to be between "monopolism" and "totalitarianism," this was due only to different degrees of difficulty in the valorization process of these respective forms of capitalism. Totalitarianism was the attempt by a weaker monopolistic group to conquer a stronger one in a super-monopolistic way, by concentrating power in the hands of a centralized ruling power. In fact, the monumental obstacles that Weimar's social reformism left in its wake were so great that, when confronted with the 1929 crisis, German capital's only recourse was found in a monstrously aggressive version of the traditional deflationary solution (the absolute compression of wages and the frenetic destruction of "minor" private capitals). By focusing on capital's movements (i.e., on the constant relation between their appearance and their essence), Mattick discovered that the task necessary to preserve the theoretical patrimony of the "labor left" lay in the critical effort to tear open the "ideological wrapping" of events apparently entrusted to the exclusive "management" of capital. This fundamental analytical and theoretical attitude toward state monopoly capitalism sets him apart from Korsch during the crisis and the World War. Mattick grounded the theoretical and cognitive possibility of Marxism in the permanence of the dialectical relation between use-value and exchange-value. At the same time, however, he clearly recognized that the constituted concrete-ness; of the Marxist categories is not attained merely through a process of "reflection," but by returning the given to the concept. By setting itself up, from the crisis onward, as the rupture with the ideological "naturality" and "eternity" of the capitalist mode of production, Marxism poses class struggle as the possible rupture in the unity between use-value and exchange-value in the commodity labor-power. But the logical and cognitive constitution does not immediately coincide with historical constitution: between the two moments there is the autonomy and anticipatory character of theory as the scientific (conceptual) penetration of the "inverted world" of capital. Meanwhile, in a situation characterized by the absence of any autonomous political action by workers, Korsch had undertaken his revision of Marxism as a "science of the working class," beginning with a reductive conception of theory as mere "reflection" of the "real movement," and of the workers' praxis as "the other face" of the capitalist Organization of labor. Starting from these premises, he had predicted a "worldwide workers' revolution" as the "dialectical result" of the fascist intensification of the contradictions between the productive forces and the relations of production. As a result, to Korsch the unsuccessful revolutionary outcome of the economic crisis and the overcoming by the subject state (fascist and monopolistic) of the old scholastic Marxist separation between economics and politics seemed to contradict Marxism which had the working class as its very subject. But the mechanical juxtaposition of theory and the empirical dimension on the one hand, and between theory and praxis ("reflection") on the other, underlying the schematic counterposition between capital and the working class, resulted from Korsch's failure to root revolutionary theory in the dialectical nature of the commodity form through the critique of political economy. Thus Korsch failed to understand the Luxemburgian lesson (subsequently elaborated by the European left, even if in a contradictory and politically bankrupt way): the location in the commodity-form of labor-power of both the possibility of working class emancipation (progressively becoming the historical subject) and its function as the motor of capitalist development. By not discerning the central character of the commodity and its contradictory nature as the constitutive moment of capitalist society, he could even claim that Marx's emphasis on this moment was the source of the historical obsolescence of Marxist theory as the "reflection" of a revolutionary movement which did not pertain either to the present or to the future, but to the past. In other words, for Korsch the Marxist theory of revolution followed the emancipatory model of the bourgeois revolution. Mattick's claims that the crisis is not the result of problems in exchange (and therefore, not resolvable by the state regulating the upset world market)'0 but the result of the arrest of the accumulation process entailed a series of important analytical consequences. They enabled one to associate fascist Extra-economic violence" with the labor organizations of the New Deal accepting and internalizing the "economic" rules of the game, while bringing to light the blind automatism with which total capital asserted itself over particular capitalist groups. On the one hand, the "quantitatively" different level of the mode of accumulation (and corresponding "difficulties" pertaining Co it) explained the difference which, on the international level, set the fascist response - based on "return to the extraction of absolute surplus-value" (Sohn-Rethel)-apart from that of the Anglo-American bloc. On the other hand, the "transcendence" of the law of value regulating "total capital" allowed for the clarification of existing conflicts between the various economic interest groups within the capitalist nations struggling with each other. Linking the internal differences of the dominant capitalist groups with the valorization problems of capital (the cause of the crisis), Mattick succeeded in explaining the relative autonomy of the Rooseveltian and fascist political projects without identifying them with the sum total of particular capitalist wills, revealing their slow and tormented evolution into the "total capitalist brain," Of course, it cannot be claimed that in this way he resolved ante litteram the problem of the "autonomy" or "heteronomy" of the Nazi regime in relation to the dominant economic forces. Yet, Mattick has provided us with a rigorous theoretical model of the crisis and a useful interpretive key for a Marxist analysis of fascism and, more generally, of the function of the state in late capitalist societies. Originally published as an introduction to Paul Mattick, Karl Korsch and Hans Langerhans. Capitalismo e Fascismo verso La Guerra (Florence. 1976). English translation by William Boelhower. This version from Telos #30,Winter 1976. Skimming over and there's a bunch of small facts incorrect. Makes me curious about accuracy of the larger one.